Young traveler woman walking with a suitcase in the street. Girl opens the door and comes into an arch. Young woman walking in city centre, Roman Forum. Female traveler takes photo of old town ruins. Girl exploring Italy. Young woman walking in city centre, Roman Forum. Female traveler talking on the phone. Girl exploring Italy. Street portrait of young beautiful fashionable woman walking at the old city. Girl looking around, exploring the town. Traveling girl with backpack walking through the little street. Young woman exploring the old city, looking around. Back view of young woman walking at city street in Europe at morning. Girl exploring the old town alone, looking around. Back view of young woman walking in the city centre and looking around. Brunette girl with backpack explores new place. Portrait of young brunette woman in Rome, Italy. Happy girl exploring the city panorama. Female looking at camera. Young traveling woman exploring the new city. Attractive girl walking on the old town and looking around. Slow motion. Young brunette woman comes downstairs opposite to the Colosseum in Rome, Italy. 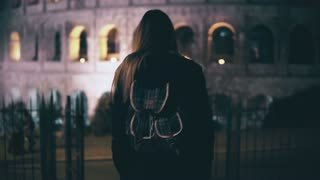 Girl walking in the city late at night.